Our December program is a celebration of the season and of architecture and landscape architecture in Western Massachusetts. The winners of the 2018 Design Awards Program will be announced. This awards program was held in conjunction with the Western Massachusetts Section of the Boston Society of Landscape Architects and was juried by AIA Maine. We will begin with a reception with cash bar. 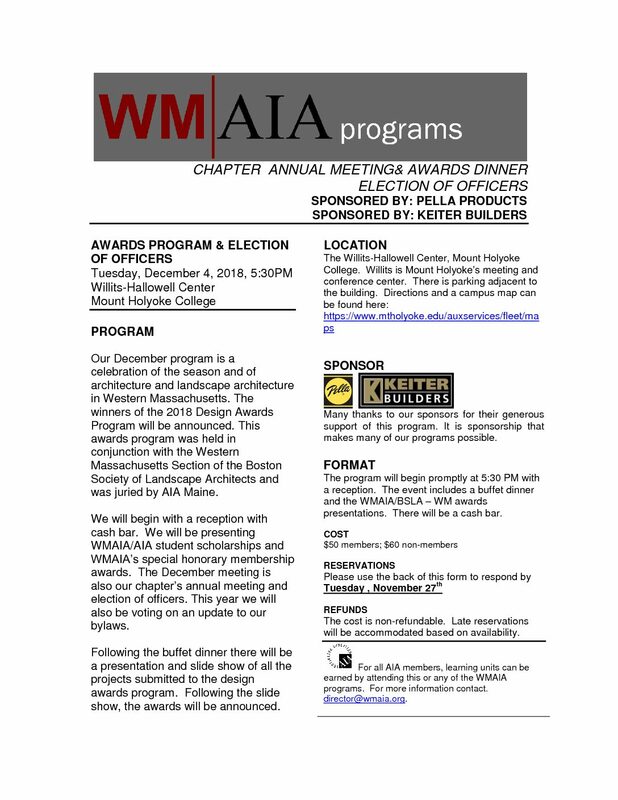 We will be presenting WMAIA/AIA student scholarships and WMAIA’s special honorary membership awards. The December meeting is also our chapter’s annual meeting and election of officers. This year we will also be voting on an update to our bylaws. Following the buffet dinner there will be a presentation and slide show of all the projects submitted to the design awards program. Following the slide show, the awards will be announced. DOWNLOAD FULL INFORMATION AND REGISTRATION HERE OR AT RIGHT. This program is sponsored by Keiter Builders and Pella Windows.